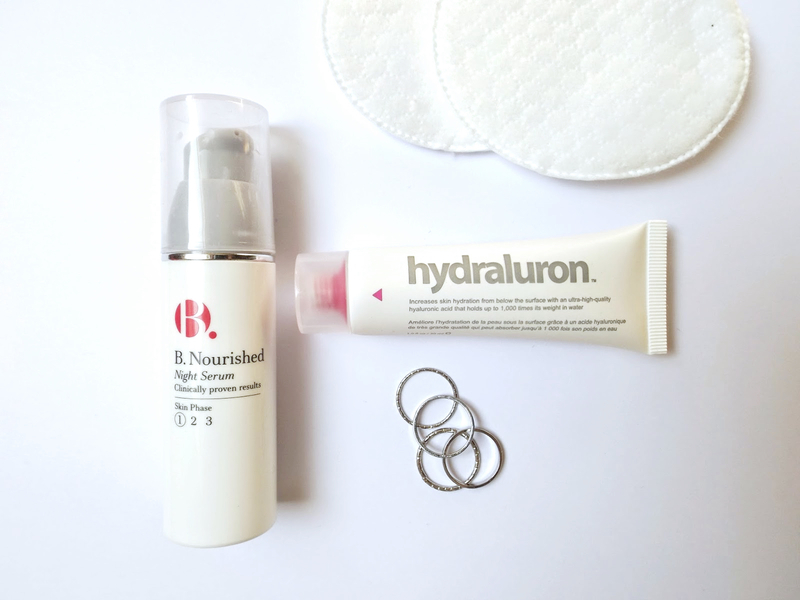 So, I stepped out of my comfort zone and stopped using my beloved Hydraluron, and for approximately a couple months now, I have been using B. Nourished Night Serum (currently half price) in its place. It's not that I fell out of love with it, I just sometimes like to change up my skincare routine, particularly with summer fast approaching. It's with this change that I think I may just have found a Hydraluron alternative. Not the same in their consistencies, but results, maybe. Although this little number is not quite a pure version as its brother from another mother, it is a Hylauronic Acid formula with added Niacinamide: easily absorbed, leaving the skin thoroughly hydrated and evening skin tone. I have found this to be true - I haven't suffered from any skin irritation and like Hydraluron, it keeps dehydrated skin at bay. I apply this in the evening after cleansing and toning and follow it with my night creams. The packaging is simple, but with a quality dispenser. This no-frill gel serum is such a lovely product and it helps my dehydrated skin no end whilst improving the overall texture of my skin, just as its little rival also achieves. Many of you, as I was, may be sceptical of the £24.99 price tag, but for me, the value is endless and is often 1/3 off in Boots. Great value for money - it lasted for 6 months and that's with everyday use. I've had no problems with it and the thought of running out panics me slightly. I suppose if I only could choose one, I would find myself opting for the Hydraluron. I really enjoyed using Superdrug's B. Serum, but I did notice that once stopping Hydraluron, I found myself slightly oilier and was reaching the powder so much more throughout the day. If oil production isn't an issue for some of you lucky ones, Superdrug's number is worth a go. It is a stunner with it's fragrance-less, non-irritating formula and bank account friendly. If I'm ever really budget stricken or Boots has sold out, I wouldn't hesitate popping over to Superdrug for a replacement. I hope this has given you dehydrated gals something to think about - I don't think you'll necessarily be disappointed with either purchases.